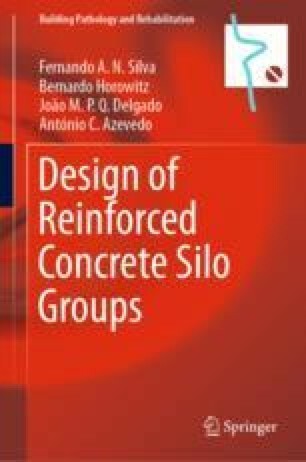 The study of reinforced concrete silo groups using the three-dimensional finite element analysis demands from the designer hard work to formulate of the problem. Aspects such as the characterization of the geometry, the determination of the loads and choice of the appropriate boundary conditions, as well as in the interpretation of the obtained results, are examples such difficulties. Despite these difficulties, three-dimensional analysis is an important tool for understanding the structural behaviour of this type of construction.